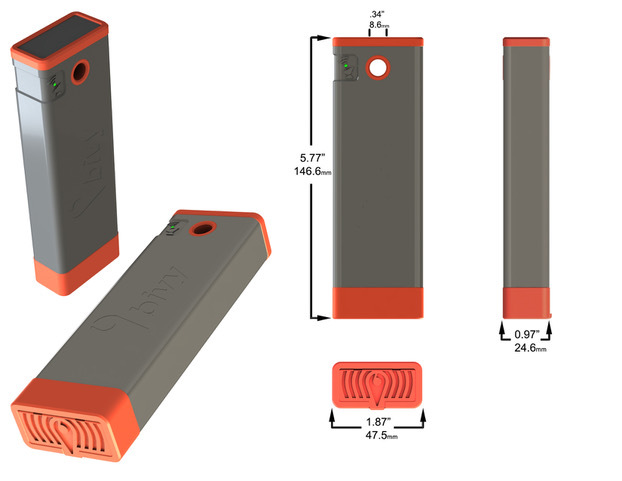 Bivystick gives you peace of mind when you are off the grid by turning your cell phone into a satellite communication device. With no contract or activation fees, you can turn it on only when you need and save money when you don't. Bivystick allows you to send and receive text messages, share your location, track your path, send an SOS message in case of emergency, and access detailed weather forecasts when you are out of phone service. Please note: You will need to use a forwarding service as they only ship to the US. It's huge compared to an InReach. you can buy packages of data starting at 20 credits and scale to as many as you want. The credits are valid for 30 days. and if you don't use them, we will let you carry them over to the next month for a small fee. So it might be cheaper than inreach/spot but its still plan based. I wonder who's sats they are going to use? Also a 6000mha battery is pretty optimistic for 3 charges on most smart phones. 2 for sure, but I guess paired with something little like a Jelly or the new atom, that could last a while. That said, having the battery be able to be drained by charging another device seems like a bad idea. The fee structure seems a little weird to me. Interesting, but I doubt it would be worth trying to use here. It doesn't do much that the other devices can do which are localized, dealing with their emergency center in the states seems like asking for trouble. None of the other features really seem to be that interesting. Sure they might have a good map app, but those exist, and it doesn't seem like they are storing the maps on the device, which would be helpful if you had a phone with low storage. I dunno, it really has a "too many eggs in one basket" feel for me. Weighs twice that of the garmin inreach mini, and does pretty much the same thing (maybe a little less).